This wiki cheese category page contains detailed information and photographs of cheeses produced in the This wiki cheese category page contains detailed information and photographs of cheeses produced in the English county of Gloucestershire. 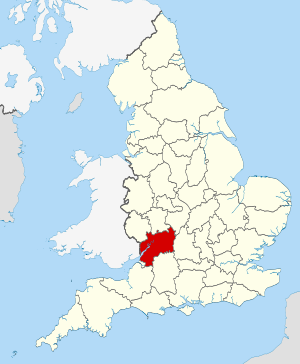 Gloucestershire is in South West England. The county comprises part of the Cotswold Hills, part of the flat fertile valley of the River Severn, and the entire Forest of Dean. The county town is the city of Gloucester, and other principal towns include Cheltenham, Stroud, Cirencester, and Tewkesbury. Gloucestershire borders the preserved county of Gwent in Wales, and in England the counties of Herefordshire, Worcestershire, Warwickshire, Oxfordshire, Wiltshire, Somerset and Bristol. The county is famous for its Gloucester cheeses and The Cooper's Hill Cheese Rolling and Wake is an annual event held on the Spring Bank Holiday at Cooper's Hill, near Cheltenham and Gloucester. People from over the world take part. From the top of the hill a round of Double Gloucester cheese is rolled, and competitors race down the hill after it. The first person over the finish line at the bottom of the hill wins the cheese. In theory, competitors are aiming to catch the cheese, but since it has a one second head start and can reach speeds up to 70 mph (112 km/h, enough to knock over and injure a spectator as it did in 1997), this rarely occurs. The tradition is at least 200 years old. Suggestions have been made that the event may either date back to Roman times or have been a pagan healing ritual, but there is no evidence for this. Pages in category "Gloucestershire cheeses"
Page modified 09:46, 26 September 2016.